The Gold Libertad was first released by Mexico in 1981. Some aspects of the coin change every year in order to attract collectors and investors. This practice of changing the design of the coin is very popular amongst gold and silver coins. You will see collectors adding Gold Libertads as a great addition to a collection but at the same time you will find that there are a lot of investors that invest in the pure gold that is in the coin. The gold Libertad has a purity that is the highest among North American coins and other gold coins in the world. The obverse side of the Gold Libertad depicts a winged Victoria which is the goddess of victory in Mexico. It is also the symbol of Mexican Independence. The winged Victoria is depicted standing in front of the Mexican volcanoes of Popocatepetl and Iztaccihuatl. The reverse side of the coin has the image of the Mexican coat of arms. The newer version of the coin has the Victoria depicted from a slightly different angle and the reverse side of the coin still has the coat of arms although it is surrounded by Mexico’s historic coat of arms. The Gold and Silver Libertad is an absolutely beautiful coin and collectors enjoy its beauty as well as investors. 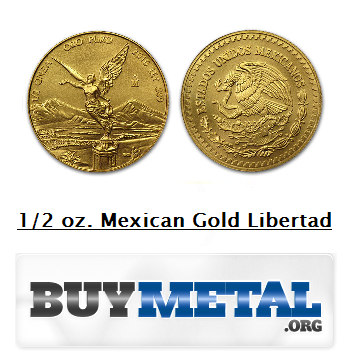 The Gold Libertad is available in primary sizes of 1/10, 1/4, 1/2 and 1 ounces. There are also 1/20th ounce coins produced, but these are not as common and as mainstream. For the vast majority of buyers, 1/10th of an oz. and up is where real demand is found. 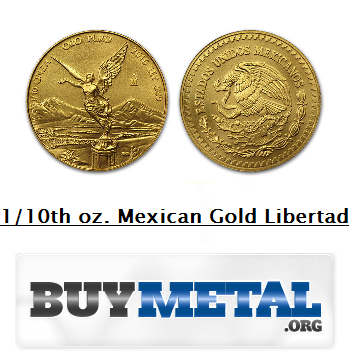 The 1/10 ounce Gold Libertad has a diameter of 20 millimeters. This coin is affordable for anyone, whether is be investors on a tight budget or a new coin collector. At 1/1oth of an ounce, it won’t break the bank. 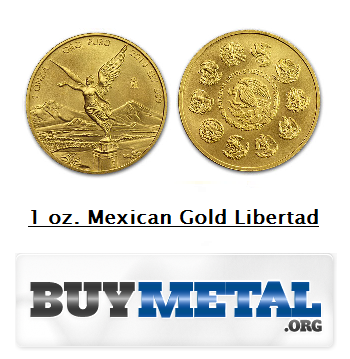 The quarter ounce Gold Libertad has a diameter of 27 millimeters. Roughly middle of the line in terms of weight in Libertads, the 1/4 oz. is sizable yet not overbearing and can be obtained for a very reasonable price. The half ounce variety of the Gold Libertad has a diameter of 33 millimeters. These coins are just one step away from the ultimate size of the gold Libertad. For half the price of a full ounce, this coin delivers significant bang for your dollar. The one ounce variety of the Gold Libertad has a 40 millimeter diameter. As all collectors or general buyers of any gold coins know, the one ounce version of any coin is the most desirable, and the Libertad is absolutely no exception to this rule. Gold Libertads are among the most popular gold coins in the world. This is because of their high purity levels which is .999% pure. This high purity is sort of unusual for a gold coin because since gold is a soft metal, most countries mint their gold coins with copper or part of other metals to add durability. Because the design of the coin is slightly altered every year it makes each and every version of the coin unique. The culmination of high purity and beautiful design means that this coin is perfect for collectors and investors alike. Apmex should be your first place to look for Gold Libertads and from there you will have an idea of what a good price is and what a bad price is because Apmex offers the most competitive prices around. North American buyers are lucky because the coins are easily found on the continent. Also, Mexico produces high mintages of Gold Libertads every year and that makes them easier to find, and cheaper to buy.